Sometimes life brings you cherries. Or is it lemons? 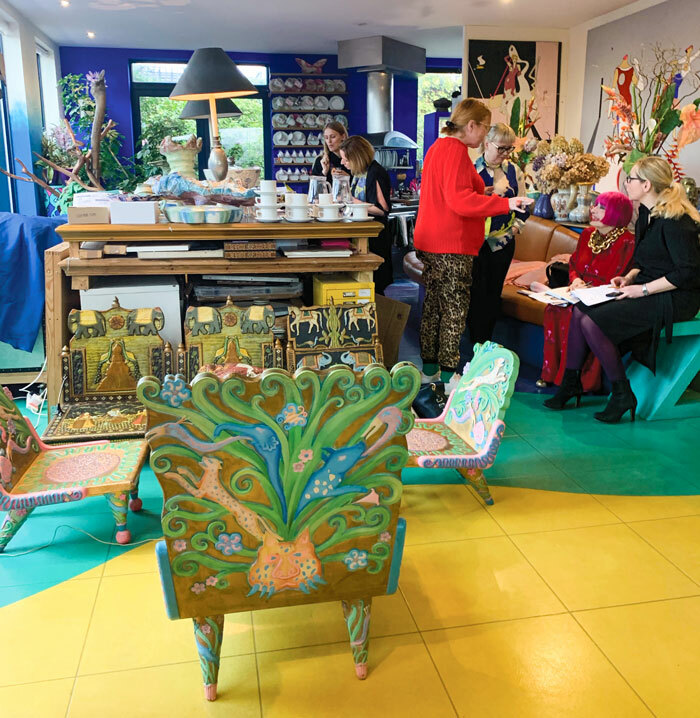 – better still an invite to an intimate audience with Zandra Rhodes! I graciously accepted the latter, of course. It would be rude not to. There then followed the inevitable what-to-wear meltdown. My wardrobe is basically monochrome. But the tulle skirt and striped Tilly Agnes top served me well. 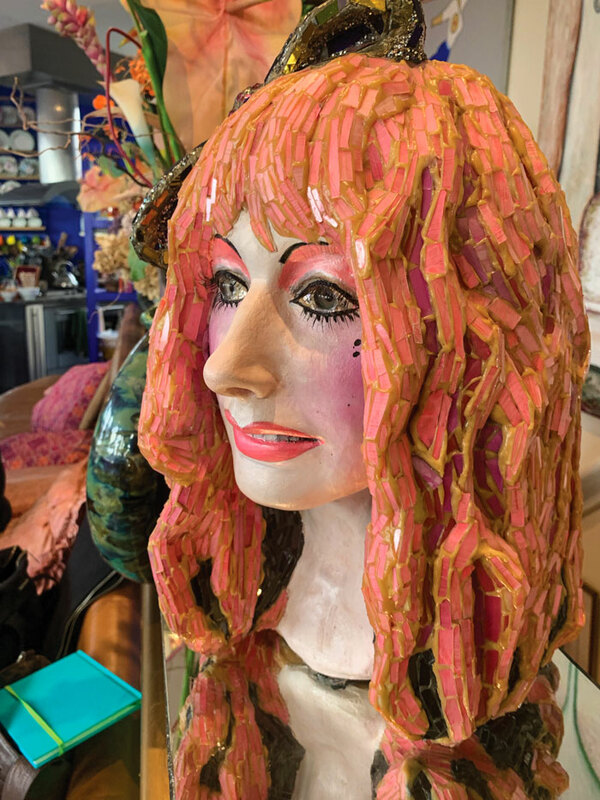 And off I tottered to Bermondsey, South London – home to the London Fashion and Textile museum and Zandra Rhodes Rainbow Penthouse! 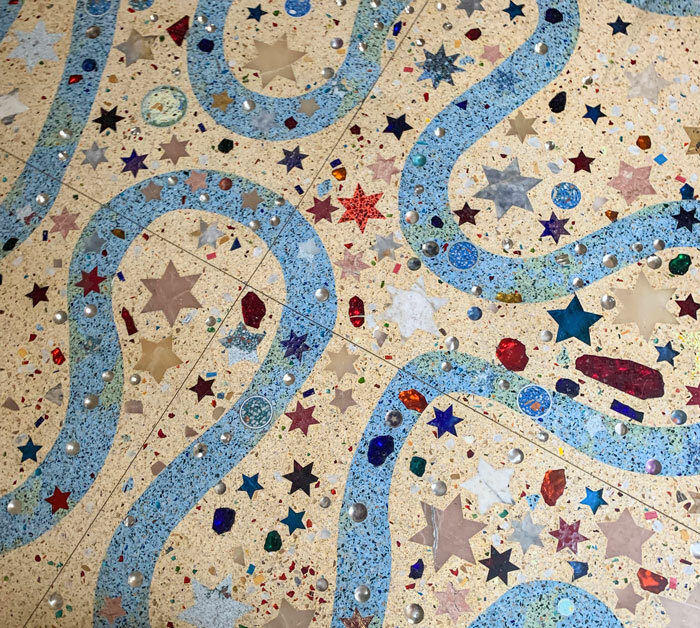 Clip-clopping over a jewel-emblazoned stone floor, overlaid with that iconic wiggle design, I knew I’d arrived at the right place. I took the lift up to the Penthouse. The door opened and the colours were right there – shouting loud. Shouting this is totally Zandra’s pad! 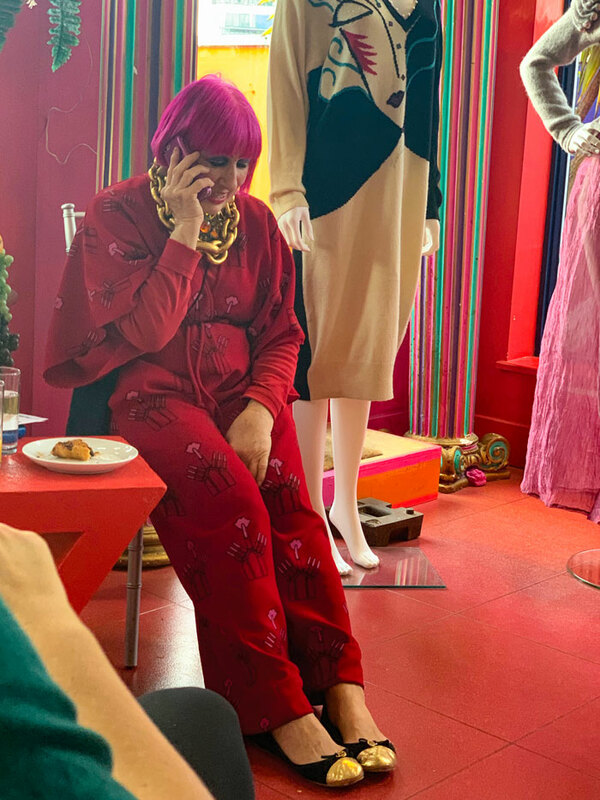 And there was Zandra busying around in her gold-tipped pumps, book under one arm, croissant in the other, dressed impeccably in a bright red and pink kimono-wrap jumsuit. The design of which was all hers of course – that iconic lipstick print, still living on from when it was born circa 1968. Aside from her successes she talked about her many knock backs. How for instance she approached Sandersons to sell some of her designs. They said her work didn’t sit at all well alongside their typical wallpaper collections. But all the same, purchased a single rose print in support of her, with the prediction that she would either fall flat on her face, or be a huge success. Well its very apparent what happened after that. And Zandra had no intentions of adapting! Zandra talked about process, how she first designs the print and then the garment design follows on, inspired by that print. She walked over to a silk chiffon dress adorned with another of her iconinc designs – the ruffle print. Edgy romantic boho chic. Right there in the room. Noticeably, she didn’t once call for her assistant to retrieve or pass her anything. She just got up from her seat to show us, herself. I’m already impressed by this and one of the questions asked, confirmed my thoughts. What would you say is the secret to the longevity of your career, Zandra? “Being boringly hardworking” was her exact reply. This is not entirely a surprise already. She is sharp, witty, down to earth and recalls every major pitstop of her working life to let us know where she came from and how she landed up. So much pride but not a scrap of arrogance, no sense of entitlement, though relishes the title of Dame. And there’s reason behind that relish. She is bemused by how ‘quiet’ British Designers are on the global stage. She truly believes that the UK is home to some of the most talented designers in the world yet they disappear in to the fading archives of our memories. “Does anyone know of Jean Muir?” she says? Embarrassingly, I knew the name and had to look her up as soon as I left. How could I not know about this amazing designer hailed as the ‘English Vionnet’? So I can see how being honoured as Dame Commander of the Order of the British Empire would help to get the word out! And I am certainly hanging on to Zandra’s every word right now. 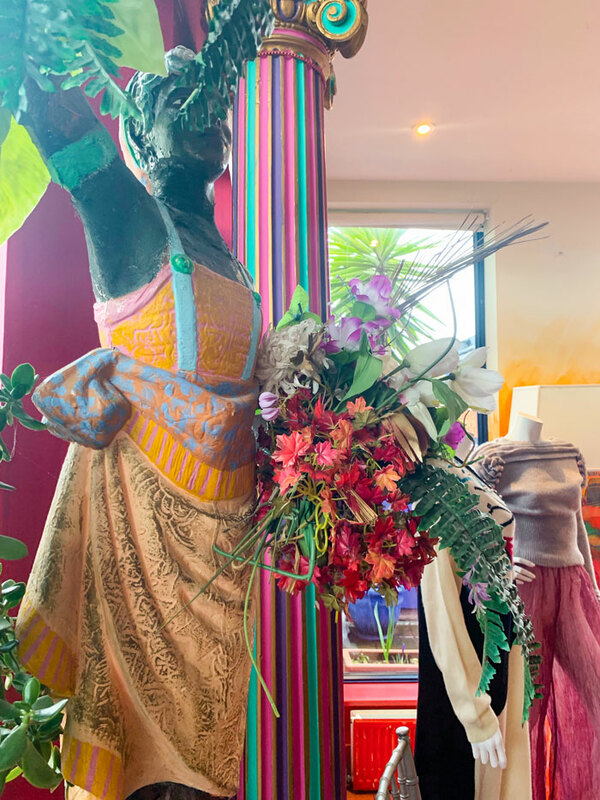 On display, were posed some mannequins adorned in Zandra’s vibrant and most signatory creations that hadn’t seen the light of day for many years. 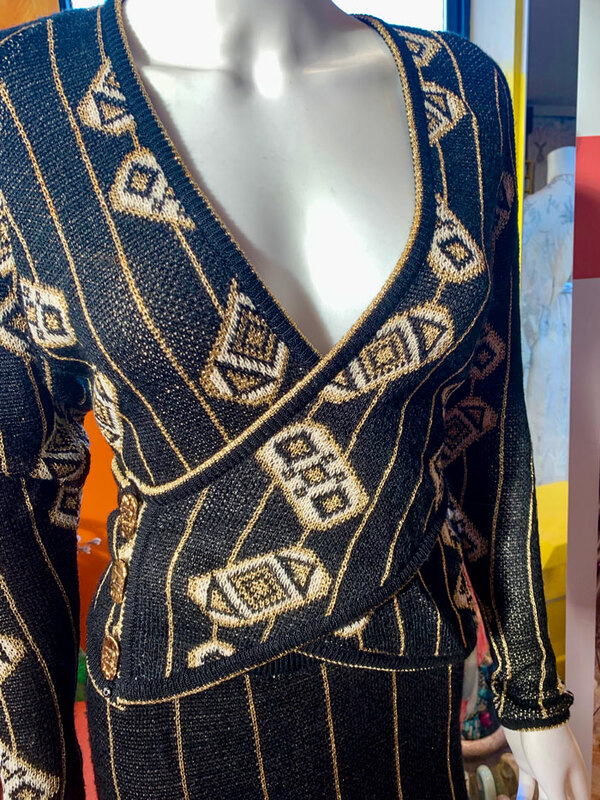 It was such a privilege to see the black and gold knit dresses from her 1985 Egyptian collection. 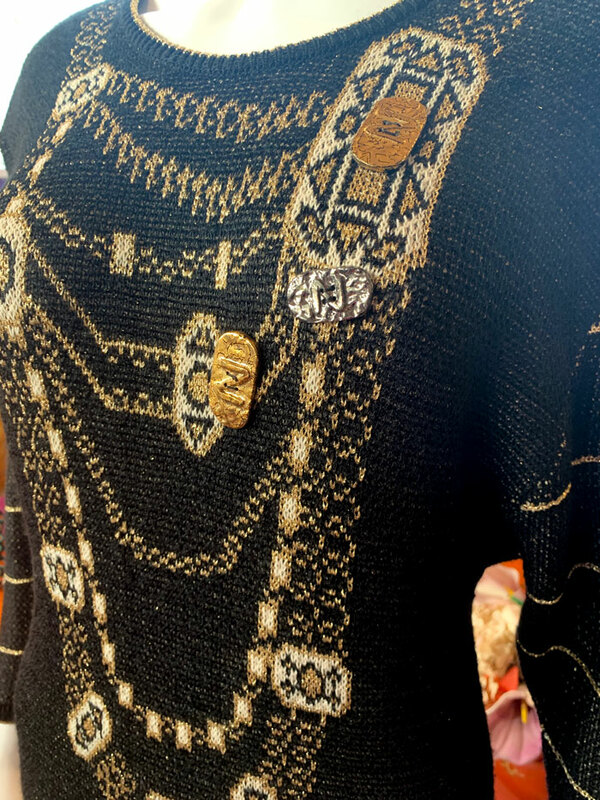 I love how the chains are worked into the design and the scarab inspired embellishments. On the second mock-wrap dress, the interaction with the stripes and the placement of the graphics is so striking and I would totally wear this today. 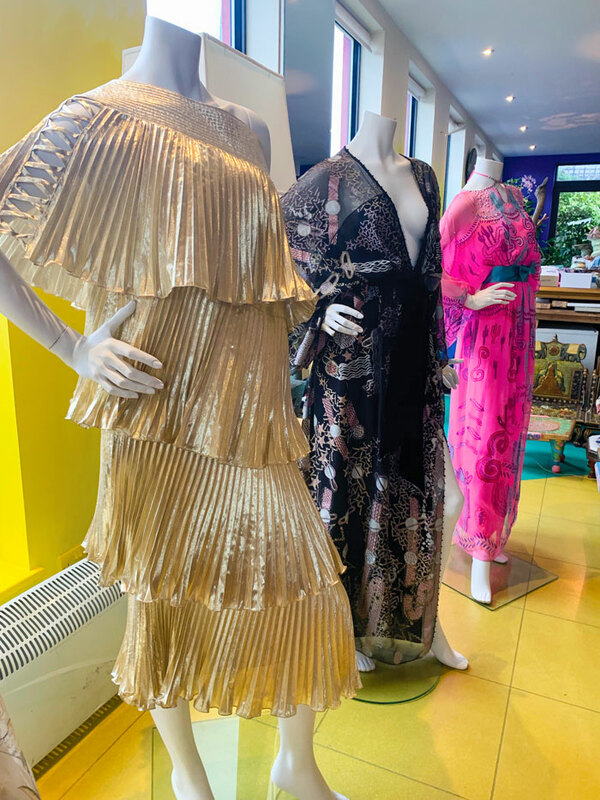 The chosen selection had been preserved in boxes and almost forgotten about until the planning began for her forthcoming retrospective: Zandra: 50 years of fabulous which will be held at the London Fashion and Textile Museum in September. 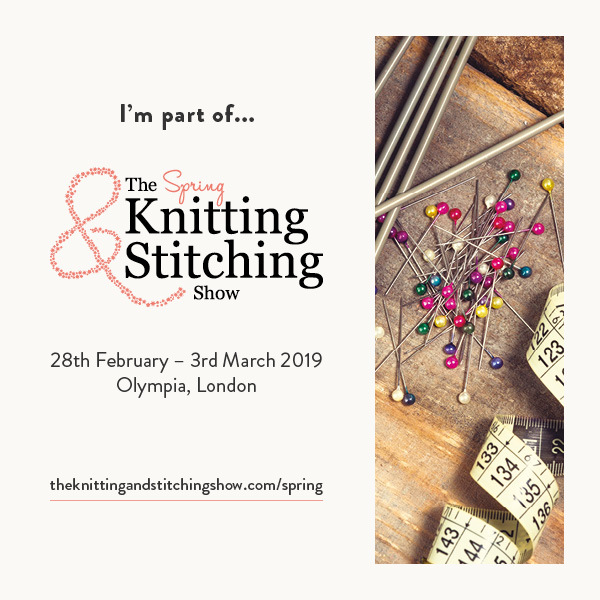 These were but a few of the exclusive selection that will also be making an appearance at the Spring Knitting and Stitching show 28th February – 3rd March 2019. Have you got your ticket yet? Read on to see how you can win a freebie! Who have you most enjoyed designing for? Zandra described the pleated sleeves on the iconic Freddie Mercury outfit as one of her favourites. And the pink off-the-shoulder chiffon dress for Princess Diana. 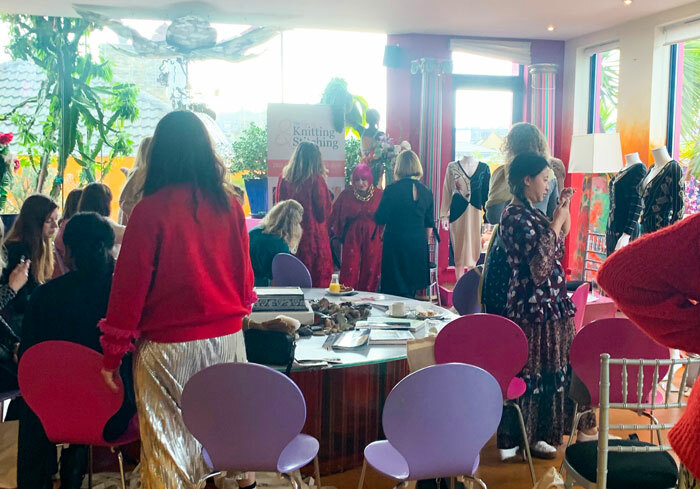 She chuckles at the prospect of a royal coming to visit her studio in Bermondsey for a fitting and describes how she went, garments laid over her arm to the palace! There are things you have to consider when making dresses for the Royals. For instance Diana was quick to rule out any wrap dresses, claiming that the paparazzi would be waiting outside the car, willing a gust of wind and the ‘perfect shot’! Is there another Royal you’d like to dress? We all agreed that we’d love to see either. “I have no idea,” Zandra says sharply! (High five to the the no-faff response) And recalls that the original sample dress for Diana was black and shocking pink. “The royals never wear all-black outfits.” she adds. I never knew that but it makes sense that black garments are reserved for funerals and sombre occasions. The Queen herself is famed for standing out in a crowd in her colourful outfits. And I suppose it makes a reporters job a little easier! It is around this time that the telephone rings – a loud classic landline tone. Zandra continues talking to us and then with a little irritation says. “Just ignore it. It’s just an emergency line. No one knows that number. If they really want me they’ll call back.” The ringing continues and Zandra asks her assistant to take it off! “I’m not at home!” she yells across the room. Then her mobile starts ringing. An upbeat and casual conversation continues before us. Plans being made to meet in Brighton. It feels a bit rude to be listening in but it would have been far more rude for the twenty or so of us to up and leave the room! But you are Zandra Rhodes! I’m thinking. Do you wear clothes designed by others or do you only ever wear your own? “I always wear my own. But if on the very odd occasion I do wear a pair of jeans I will paint them to make them my own.” She showed us examples from her book of a painted jacket and jean set. I can’t show you that. I’d have to actually kill you! I’m inspired already. I painted a design on an outfit once (see here) and I want to do so much more now. Do you dress up when you are working? Zandra in a tracksuit. Trying really hard to compute. Really hard. Interruptions! Constant interruptions and not enough time. There’s always something that stops you getting on with what you actually want to do. Resonation maximum magnitude… Me too! And what advice would you give to students or young people starting out? I take a big massive gulp of air at this point. Holding on to someones every word could be a sure path to suffocation if there were to be too many! I’ve heard people say this before. But not with such conviction. And certainly not from the mouth of such a wonderfully passionate and iconic 78 year old who claims that she’d hate to have nothing to do and has absolutely no plans on hanging up her tools. In fact secretly I’m pretty sure she’d love us all to bugger off so she can cut some potatoes up for a new print design. And yes she has used potatoes! 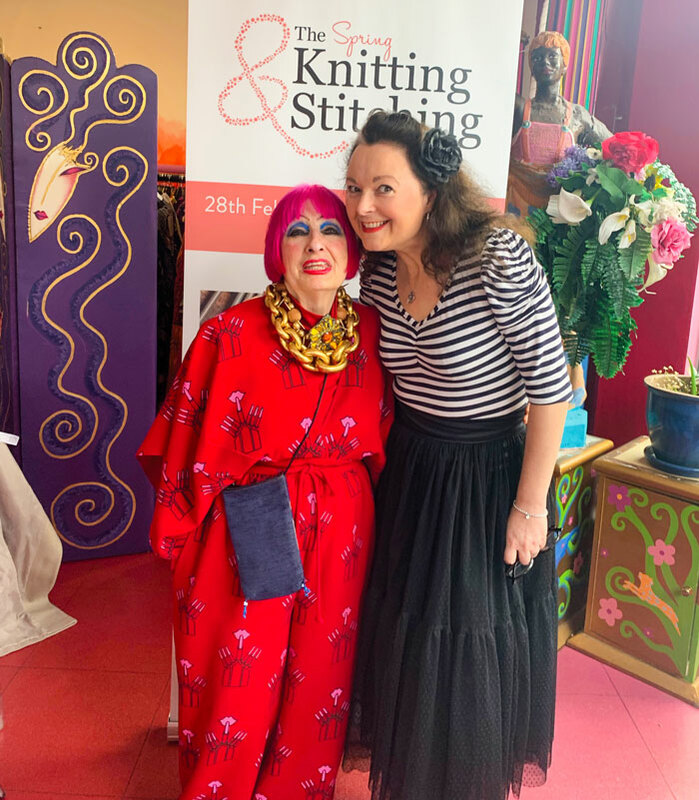 I can’t wait to see the rest of Zandra’s exhibits at the Spring Knitting and Stitching show. And it’s really soon. So who wants to come too? Leave a comment below and include the words ‘count me in’! Or hop over to follow me @ooobop on Instagram and leave a comment there. The winners will be drawn at random from an actual hat. Giveaway closes at midday GMT on Monday 18th February and winners will be announced later that day. Should you win, your postal address will be required so that I can post you the tickets. Good luck everybody! Hope to see you there. Don’t know about you but I’m off to rifle through the salad drawer! All views and photos my own and words spoken by Zandra best I can remember.